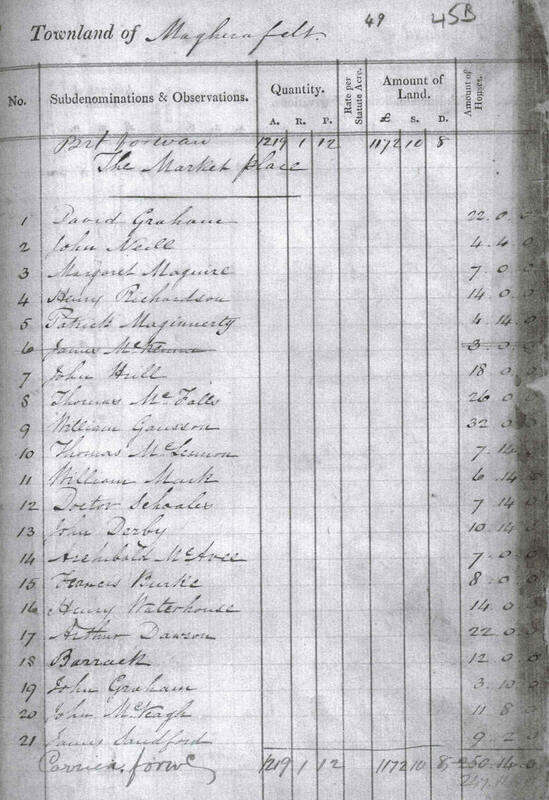 The valuation of the streets in the town of Magherafelt took place in 1832 and the results were recorded in books which survive in manuscript format. Here you will be able to see pages 49 to 57 from book VAL/1B/535A which lists the properties and their occupiers in The Market Place, Charity Street, Meetinghouse Street, Moneymore Road, Broad Street, Castledawson Street and some houses in the country. Page 49 begins with part of The Market Place. The numbers against the properties in each street correspond to the numbers on the 1834 Valuation Map of the town. Note that some valued at less than £3.00 are stroked out later. Note that I have databased the names and streets for the entire town - Excel & PDF versions available on the main webpage.